The Tata group companies are in very able hands with N Chandrasekaran but businesses are cyclic with ups and downs, Ratan Tata has said in an exclusive interview to CNBC-TV18, firmly keeping his faith in the current chairman of Tata Sons. "All I would like to say is that I feel that the group is in very able hands with Chandra. Businesses are cyclic, they will have their ups and downs," the former chairman of Tata Sons told Suhel Seth in the interview. The group will probably look different over the next 10 years, as businesses are cyclical and some group companies may die and new ones may be set up as per the prevailing business requirements, he said. However, the group should continue to function on certain ethical standards. "The group will probably look different over the next 10 years.... 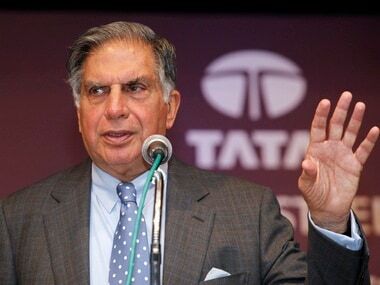 The face of Tatas may change, but so long as there is still the same drive to make this an enterprise or a conglomeration of enterprises, that operate with ethical standards and value systems, I would feel very proud," he said. He also said the group has worked with companies when they are in peril and brought them up. "Hope we can continue to do that," he said. The Tata group has been going through a rough patch ever since the unceremonious removal of former chairman Cyrus Mistry last October. Mistry was chosen as Tata's successor in November 2011 and was appointed Deputy Chairman of Tata Sons, whose board he had entered in 2006. He was made chairman on the basis of his representation from Shapoorji Palonji, the largest shareholder in Tata Sons. There were no immediate reasons given for the change of leadership but the group later made several charges against Mistry, including that he misled the selection committee to become the chairman of the group. A five-member search committee comprising Ratan Tata, TVS Group head Venu Srinivasan, Amit Chandra of Bain Capital, former diplomat Ronen Sen and Lord Kumar Bhattacharya appointed Chandrasekaran as group chairman in Janaury 2017. Ratan Tata has also parised Prime Minister Narendra Modi in the interview. Recalling the days when Tata Motors was forced shift the Nano plant from West Bengal to Gujarat, Ratan Tata said: "I have known Narendra Modi when he was Chief Minister of Gujarat. I turned to him when we had to change factories from Singur in West Bengal to Gujarat. I have seen him and will never forget the way he found solutions for a company that was looking for a home." He also said as the prime minister Modi is offering the people of the country a new India. "Mr Modi as Prime Minister now is offering India, the Indian people, a new India. We need to give him that opportunity to offer that new India. He is able, capable and innovative enough to look at India afresh and I for one, am optimistic that with his leadership, India will be that new India that he has promised," he said. The statement should come as a relief for Modi, who has been dealing with a protracted economic slowdown quickened by the demonetisation of high value currencies in November 2016 and a hasty rollout of GST. The entire interview will be telecast on CNBC-TV18 at 9 pm on Wednesday.